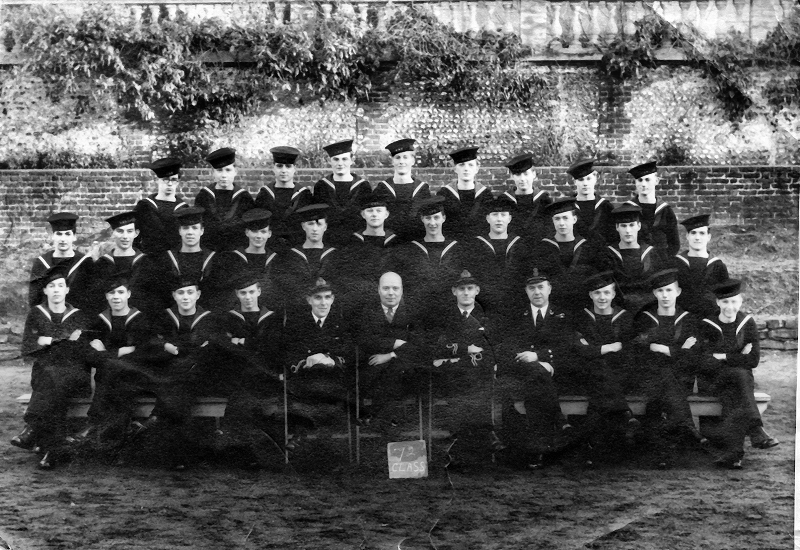 The instructor staff of the Admiralty Wireless Telegraphy Training School, Brighton, many of whom were former G.P.O. employees. 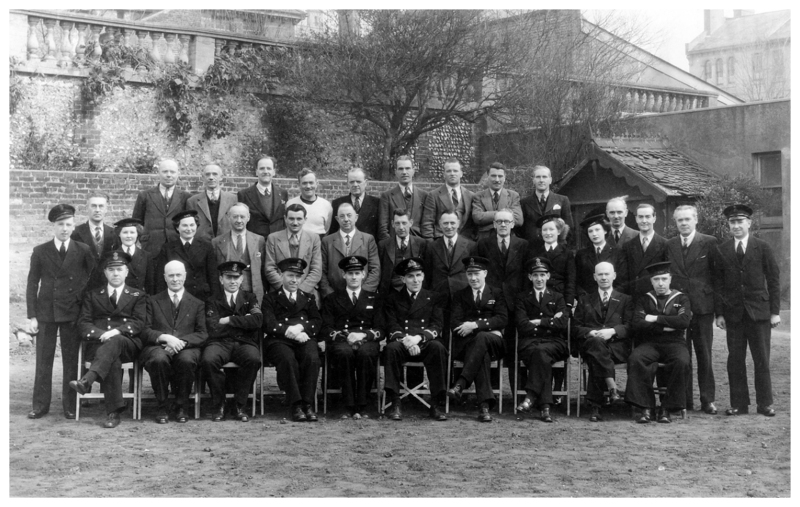 Class 23 passing out photo, the earliest one uncovered to date. 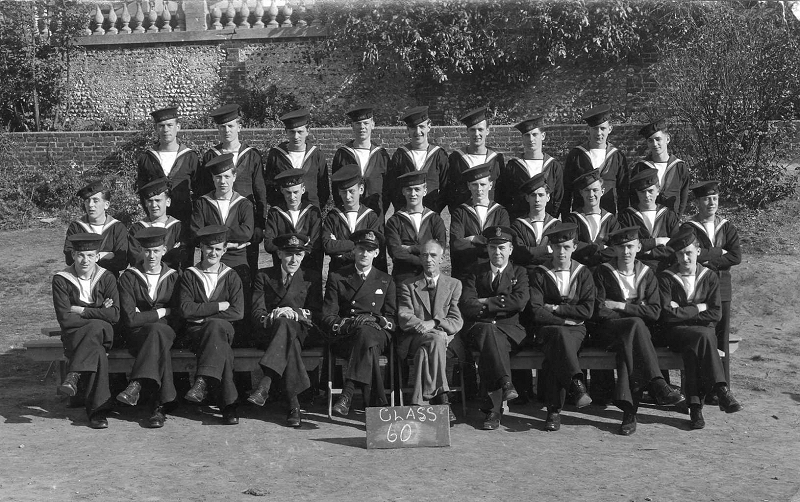 Class number 60 on passing out as trained Telegraphists (S) in the grounds of West House, c. summer 1943. Back of the Class number 60 on passing out photo signed by all those preset. 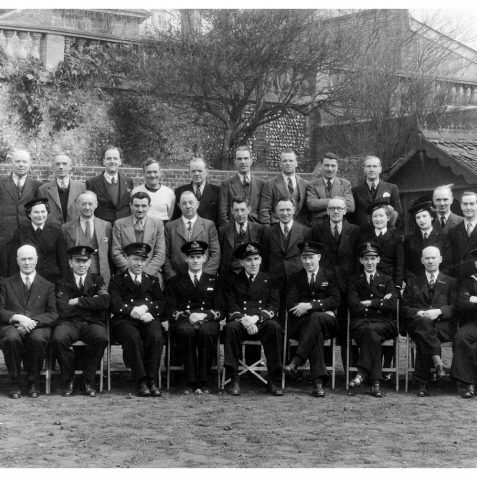 Class number 72 on passing out as trained Telegraphists (S) - Clifford Dennison is pictured middle row second on the right. 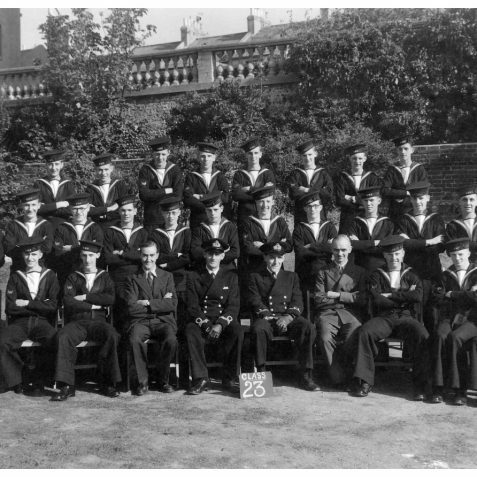 Class 95, the latest class to pass out that a photograph has been located for. 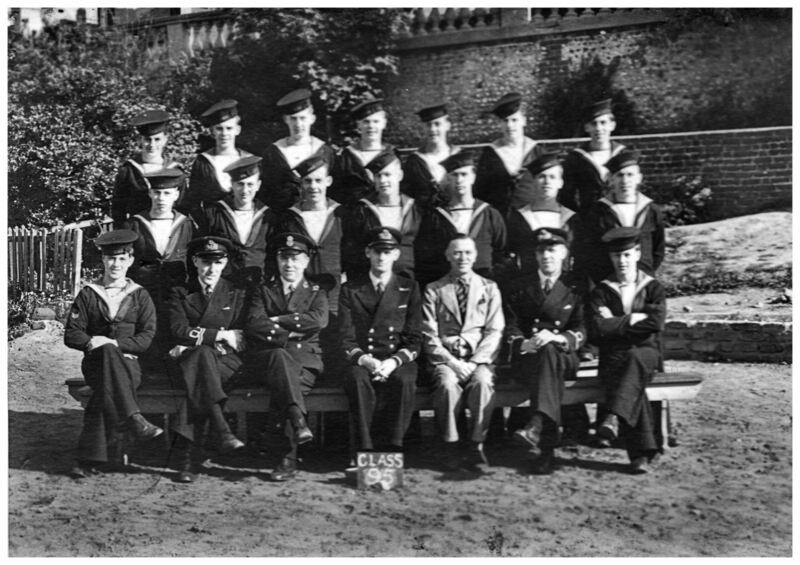 In April 1942 the Royal Navy Wireless Telegraphy Training School was opened in Brighton to train communications ratings and WRNS personnel. 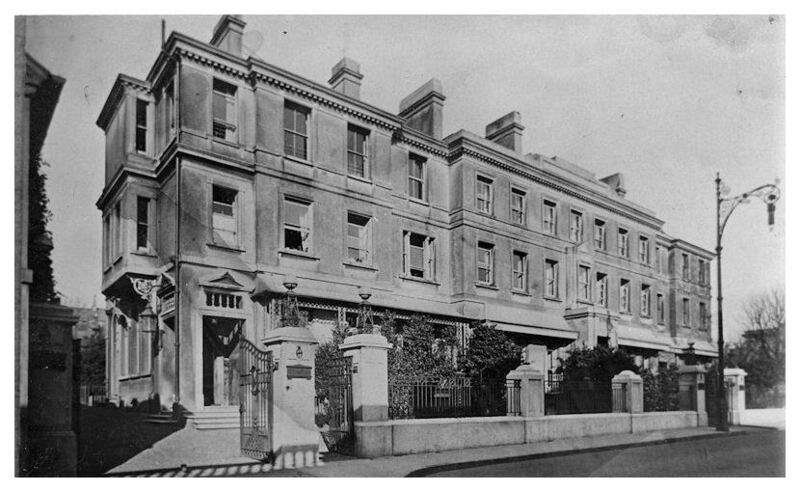 The school headquarters was established at 29 Queen’s Road with other sites in Brighton being requisitioned for the use of the school; the main instructional site was located in the former St. Dunstan’s property at West House, 12-14 Portland Place, Kemp Town. 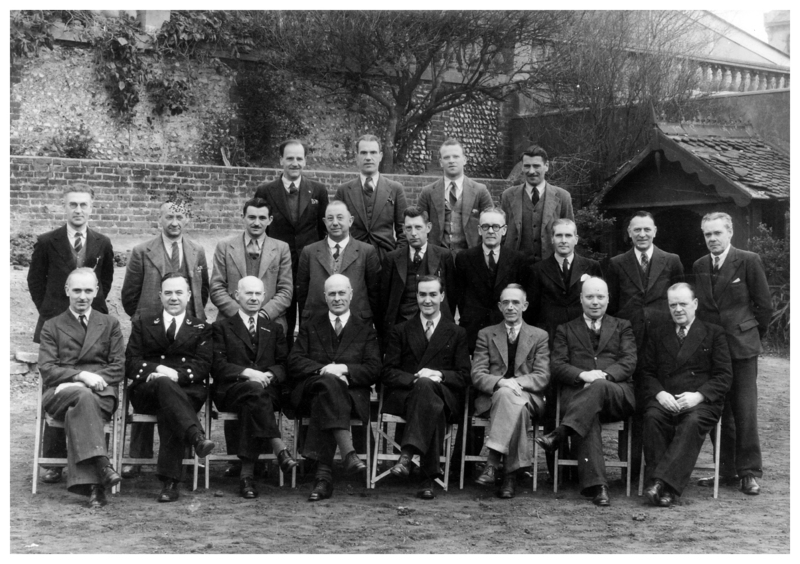 The St. Dunstan’s organisation, which cared for war-blinded ex-servicemen, had begun evacuating its premises in Brighton in the autumn of 1940 when the south coast of England became a dangerous place to be after the fall of France in June. The residential care home that was West House was relocated to Melplash Court in Dorset. The HQ and West House buildings were known by the names Brighton I and Brighton II but the unit was never commissioned with an official ship’s name. 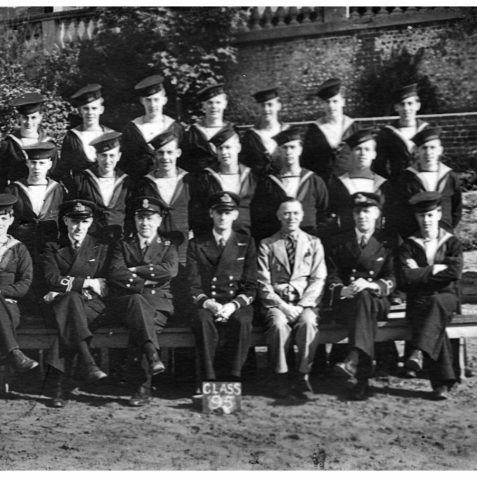 The school was most likely a dispersed sub unit of the main RN Signals School, HMS Mercury, at East Meon, near Petersfield, Hampshire. Ratings attending the school undertook their initial training at West House and were billeted locally in Kemp Town. 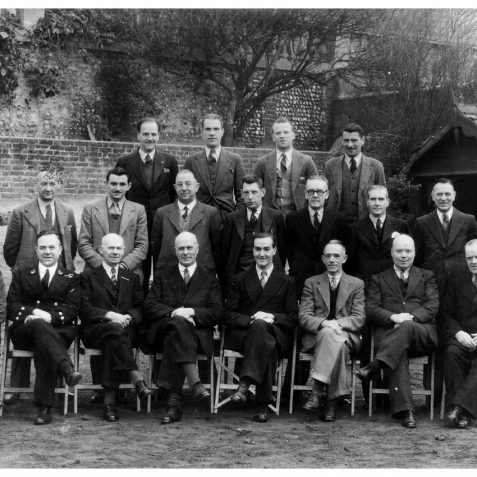 Telegraphist Clifford Dennison who attended course 72 during 1943 recalls that he was billeted, along with seven others, with a Mrs Morris at 18 Broad Street during his first stint at the school. Training was undertaken by instructor officers and Mr White, a former G.P.O. employee with specialist skills. Beginning in November 1943 a wireless telegraphy school was established at St. Bede’s Preparatory School, Eastbourne. On completing the initial phase of training in Brighton ratings transferred to Eastbourne for specialist training. In the case of Telegraphist Dennison this was training to interception of Japanese Morse code. 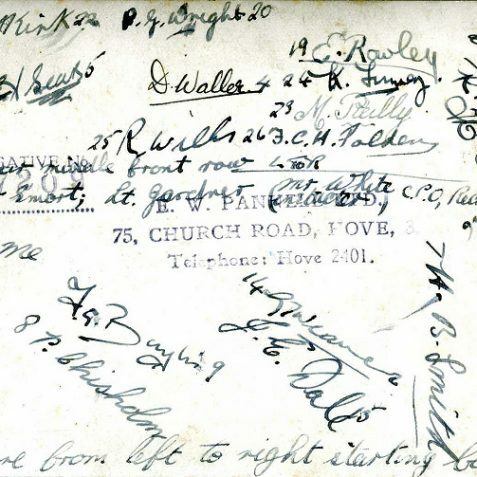 From Eastbourne ratings returned to Brighton to finish off and be passed out as Special Operators and rated Telegraphist (S). Clifford Dennison and others were billeted at 21 Lower Rock Gardens on their return. 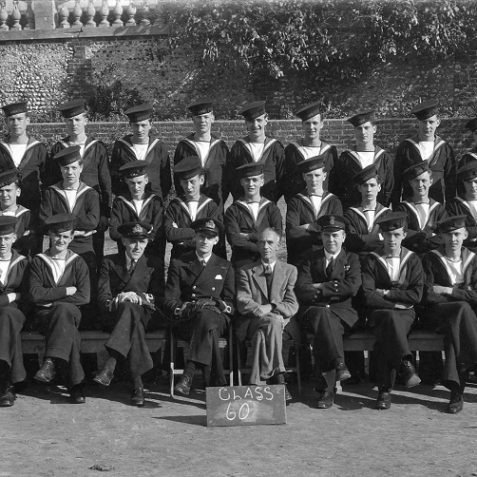 Passing out classes had a group photograph taken, this was on waste ground adjacent to West House. 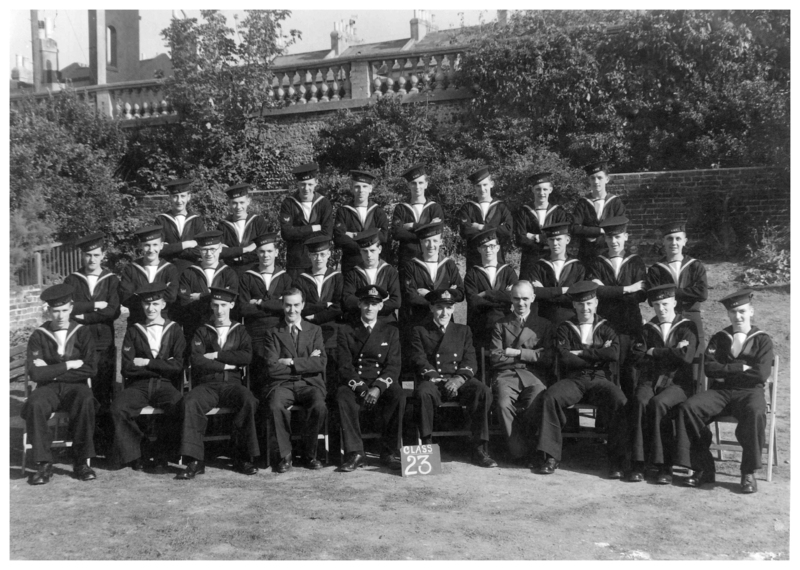 From Brighton ratings were drafted to other units, Clifford was sent to Ceylon to intercept Japanese military messages. 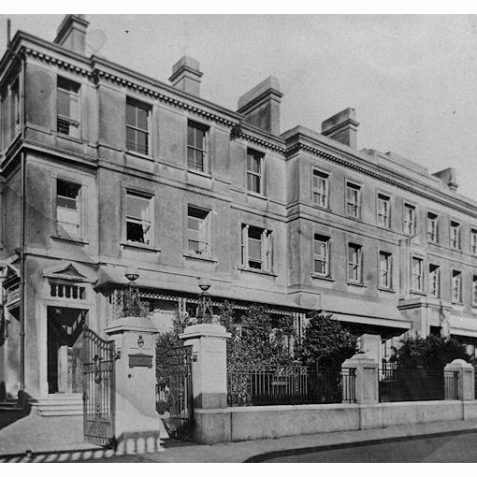 The school was closed after V-E Day 1945, and appears to have moved to a location in Wimbledon; work began to clean up and prepare West House for the return of its owners St. Dunstan’s as soon as the school had finished relocating. St. Dunstan’s was able to move their permanent residents back from Melplash and reoccupy the building in July 1945. At some point after this the name was changed from West House to Pearson House. For more photographs of classes passing out visit my other web page click here. Am I dreaming, or has this garden back drop appeared in an earlier query thread, regarding a question of where it was? This is so interesting. During the war, my Father was the landlord at the Little Globe in Edward Street and we also had what was 27 (now renumbered as 26 or 28) and 30 High Street and we had billeted on us several of the sailors on these courses. Attached to 27 in those days was the property numbered 26 which in fact was a garage to 27 with a very large room over it, and this garage was carpeted over and used as a dinning room for the sailors. A small story to add, opposite 27 was Gill & Son a small firm and one of the sailors started going out with the secretay to Mr Gill, I think the sailor’s name was Eric; eventually they married and the last time I saw them was in the late 50s when they lived up the road across from the Pepper Pot in Queens Park Road. I am so happy that I have found this site! 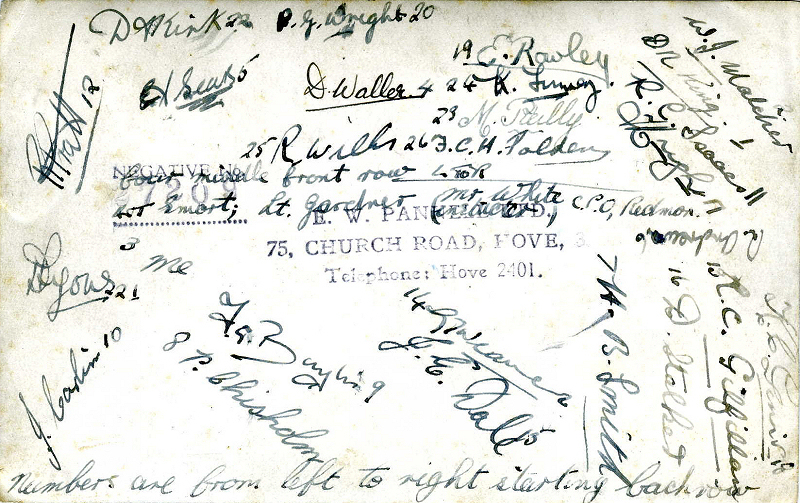 My grandfather was a lecturer in wireless telegraphy during ww2 in Brighton where the family lived. I have several photos of him sitting surrounded by his class. class23 and class 79. Also photos with other gentlemen in suits (other lecturers?) and senior naval officers in uniform. For many years I have been wondering where the photos were taken. Now I know it was West House. 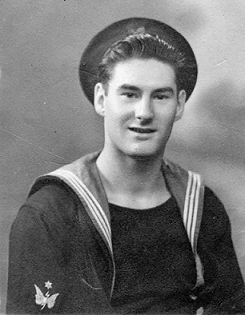 I have a photograph of my father William (Bill) GRIFFITHS (from Swansea) and one of his colleauges which he told me was taken of them in Australia, I think he enlisted in 1943 – both have Telagraphist arm badges – I know very little of my Dad’s service other than he talked about HMS NEWCASTLE? Also THE STIRLING CASTLE and he may have at one time been a submariner. I so enjoyed finding this information, thank you! My late husband, Rowland Neil Linell, also took advanced training at St. Bede’s. He intercepted Japanese traffic. He was in Ceylon, where he was confirmed in Galle Face Cathedral. He was also sent to the Cocos Islands. I wonder if anyone knew him, and would be thrilled to hear. Can anyone shed any light on what were the W/T3 and T.D. courses? Michael, the W/T3 course was undertaken by trained Telegraphists in order o be rated Leading Telegraphist. As the excerpt you include shows, the W/T3 course could be undertaken at several different places – Brighton is not one however, only specialist Telegraphists were trained here. As for TD – I don’t know what this stands for but I intend to find out. 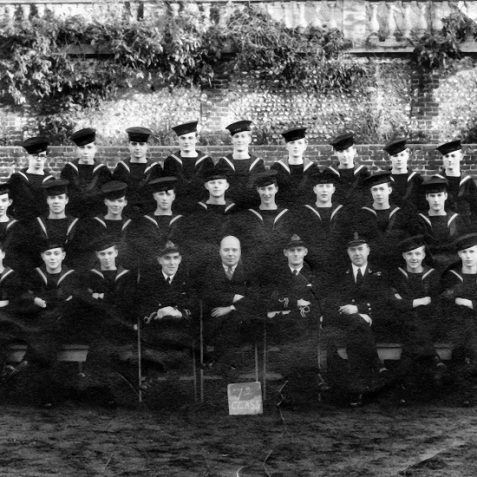 I was astounded when I saw my Dad in the photograph of “Class 20”. He is sitting in the front row, third from the left, I’dd like to know anything about his Service. If anyone knew him I would welcome any information.